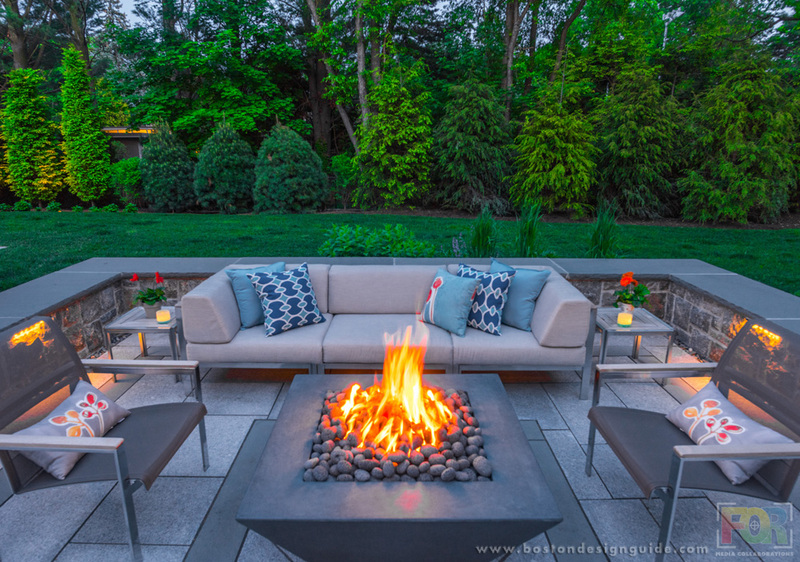 Sure, at dusk there’s a temperature drop and a chill in the air, yet still we’re seeing a warming trend even as it gets cooler, thanks to fantastic fireplace and firepit additions to outdoor landscapes. There’s no denying the allure of glowing embers or the dance of flames as you and your family and friends gather fireside. 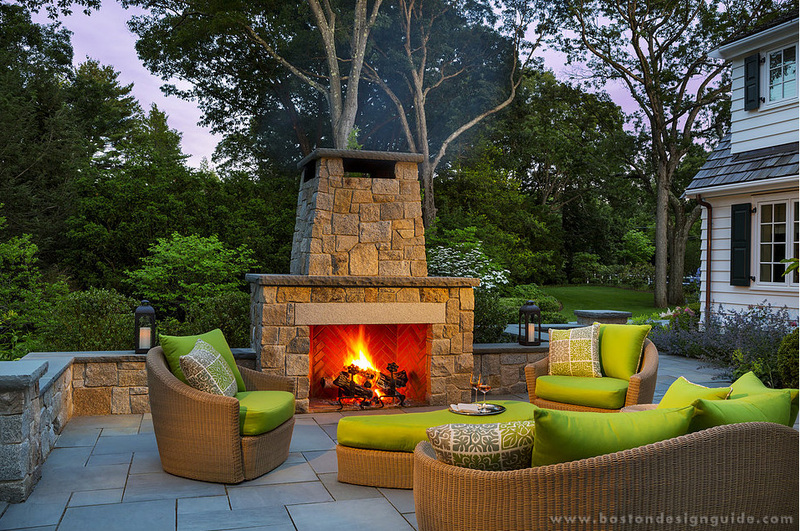 This fireside terrace by Dana Schock and Associates is part of a larger outdoor program for a Brookline home, still it has its own identity… and agenda, which is, of course, to laugh, linger and chat by the fire’s light and warmth as nighttime makes its descent. 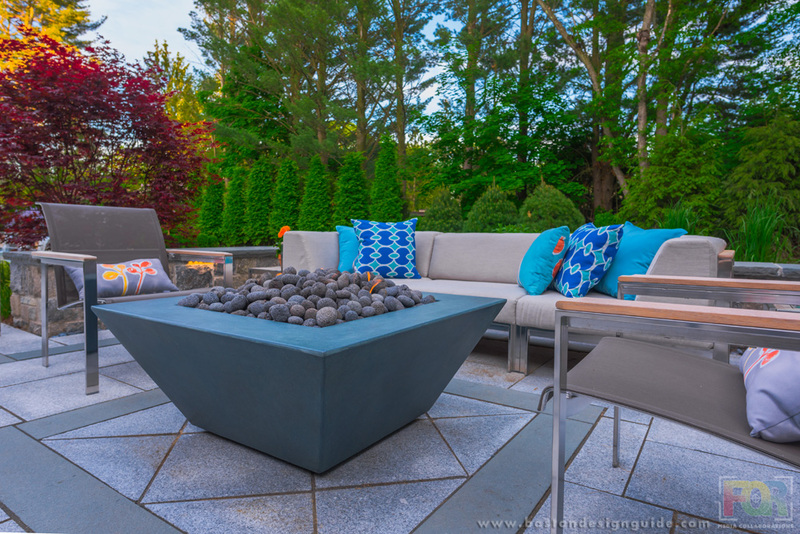 This blue square firepit has a sculptural form and makes a striking centerpiece to this alfresco living area. Its cool hue and lava rocks play well with the slate-toned stones of the hardscape. 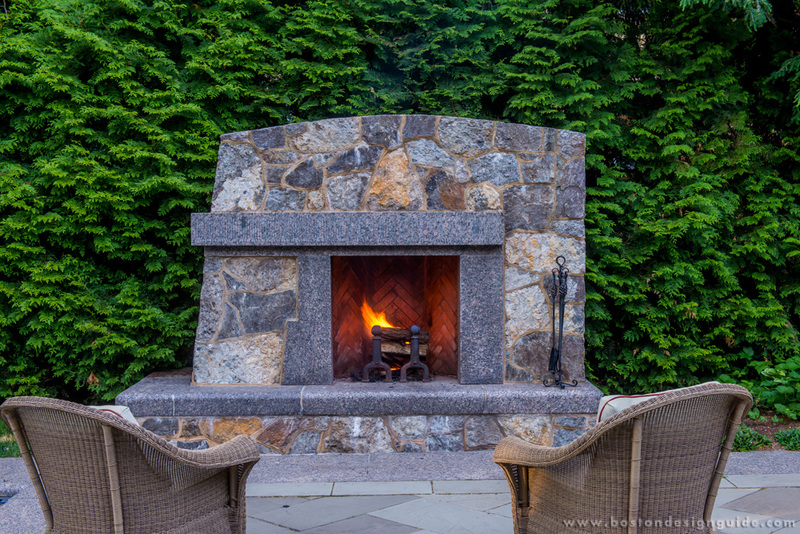 Designed by Gregory Lombardi Design, this unique stone hearth was created for a young family who moved closer to the city but still wanted to kindle the indoor-outdoor connection of their former suburban home. To that end, the landscape architect gave the homeowners the elements in the form of a beautiful year-round outdoor spa and the above fireplace. The latter is an inspired work of masonry that is a perfect foil to its lush, leafy backdrop. While in keeping with the Victorian-Era home, the fireplace has a slightly unconventional flair. Even with its heft, its asymmetrical mantel and fireside seat give it a sense of movement. In the above project, The MacDowell Company took the fire and water idea and created a place for both in a gorgeous glowing section in the landscape that bridges the pool garden and upper terrace. This dramatic stone fireplace is the nexus of the backyard and is designed to be enjoyed from every vantage: right up close within the luxurious spa, from the poolside or from the home’s upper patio and veranda. Given its starring role and multiple perspectives, The MacDowell Company’s see-through design is brilliant in this setting. 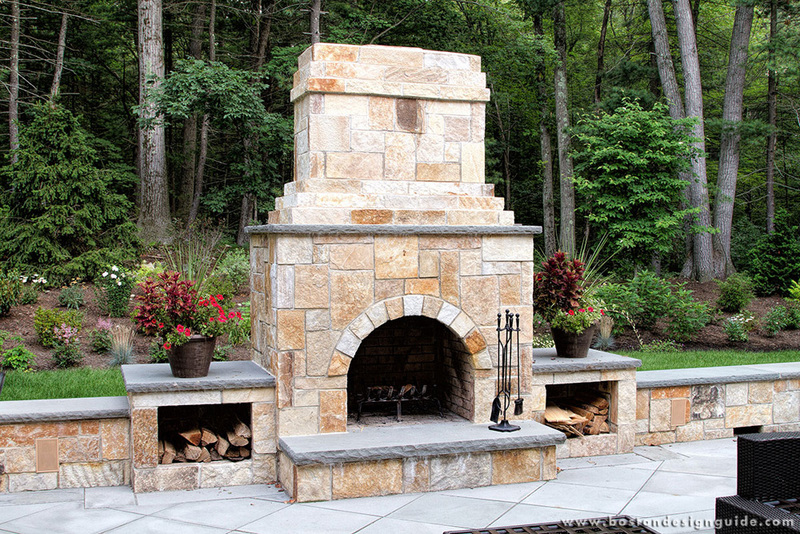 When constructed within a landscape or retaining wall, the fireplace becomes a powerful design feature. There is import that comes with such permanence, not to mention, impact. Dan K. Gordon Landscape Architects knows as much, and designed this wood-burning fireplace to be the focal point of this terrace. Its effect is welcoming and radiant. Paired with woven furnishings you can sink into, we’d wager this ceiling-free space is the homeowners’ favorite room in the house. In a Blade of Grass’ outdoor garden, again, the fireplace is worked into the masonry. The towering hearth stands almost as tall as the treetops and marks the outer limits of the yard. It’s the anchor of the sweeping grounds, though it’s imbued with a sense of intimacy, thanks to its dedicated courtyard. The fireplace pavilion sets the tenor for the whole, and unifies the stone water features of the pool and the pavers of the English garden. This multi-tonal fieldstone fireplace by Schumacher Companies is luminous against its rustic woodland setting. 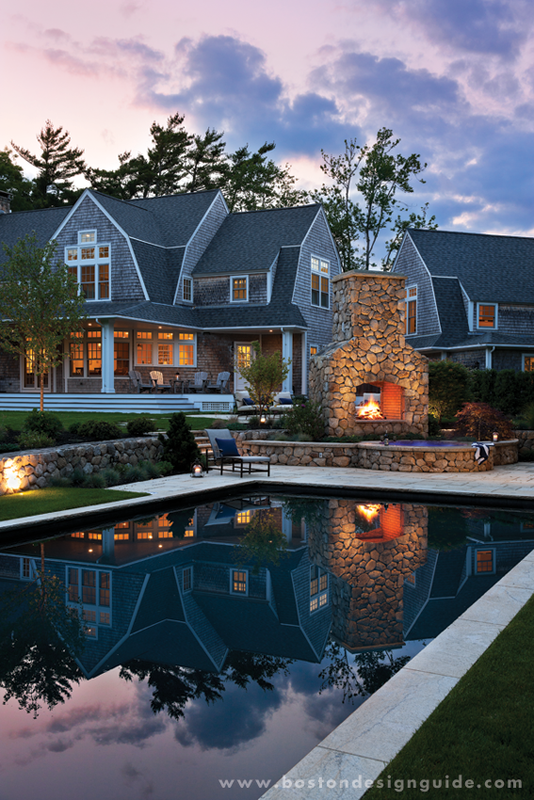 The firm is known as “landscape artisans,” and it’s not hard to see why. Through Schumacher Companies’ exacting handiwork and artful patterning, the rugged becomes the refined. The design above is not only beautiful, it’s smart, too; boxes flank the fire on either side for wood storage, and the landscape walls double as hearthside seating at varying levels. 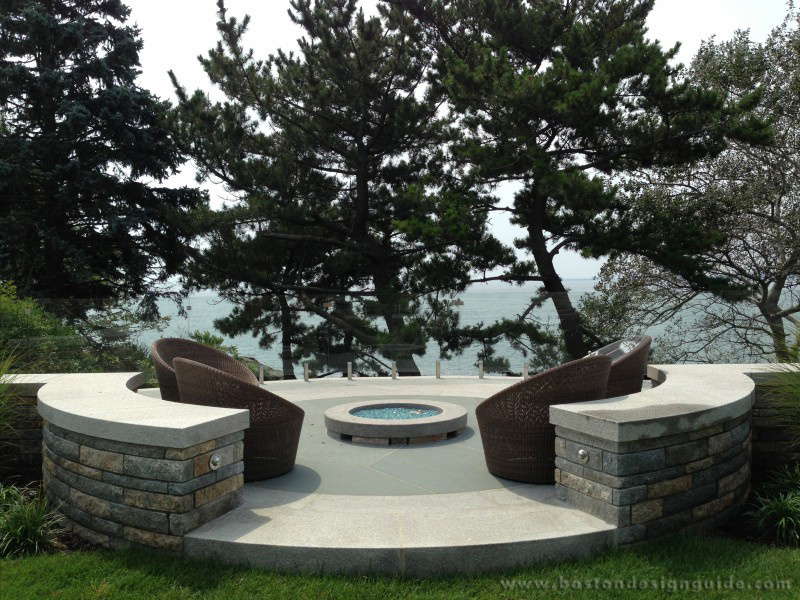 In the outdoor terrace above, KDTurner Design brings the integrated look of a built-in to a stand-alone firepit. Landscape architect Kimberly Turner clads the fire element in the same stone as the outdoor kitchen, and has positioned it in proximity to the grill area to allow the chef and those at the bar to bask in the blaze. Turner has crafted an outdoor space that’s festive and made for entertaining. The generous size of the firepit and its design allow it to stand in for a coffee table; guests and homeowners can set their drinks or their eats down on its rim. Sometimes the theory behind the firepit is to get further afield from the hub of activity and, as they say, back to nature. Matthew Cunningham’s private firepit court above is a modern and elevated riff on the campfires of our youth, when gathering around the fire meant making a small trek to a ring in a canopied spot of the woods. Admittedly, the experience of the firepit above is different, yet it still has the same quiet magic. We love its secluded air and the interplay of warm and cool tones, wood and stone, and soft vegetation against the hardscape. Leone Landscape & Construction also evokes the campfire ring idea in their clean-lined circular terrace along the water’s edge. Its curving stone walls echo the form of the firepit and terrace underneath and feel like an embrace. The same might be said for the outdoor furnishings, which envelop those lucky enough to take a seat and can be moved for optimal views and to adjust the heat one feels. The turquoise glass rocks of the firepit—the very hue of the vista—complete the tranquil scene. 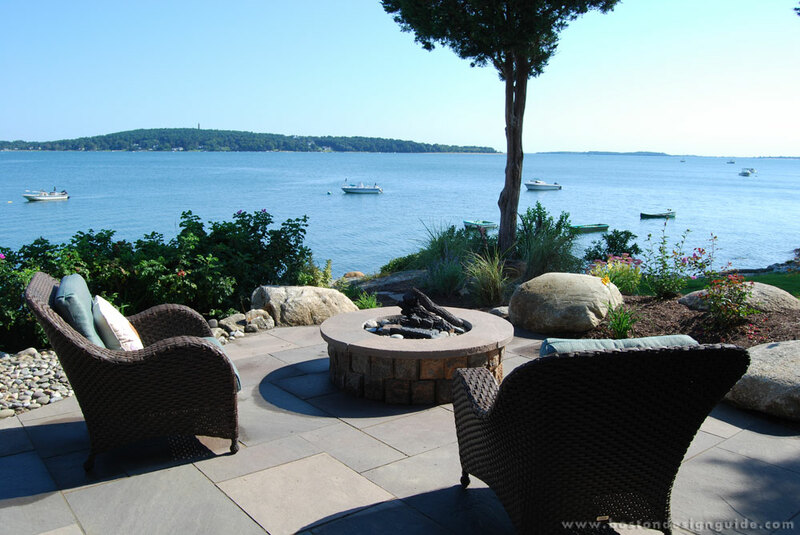 In this beautiful vantage overlooking Rocky Nook in Kingston, The Gardeners positioned a gas firepit on the outermost lip of the terrace, keeping the focus on the glow of the hearth and the sweeping coastal panorama. 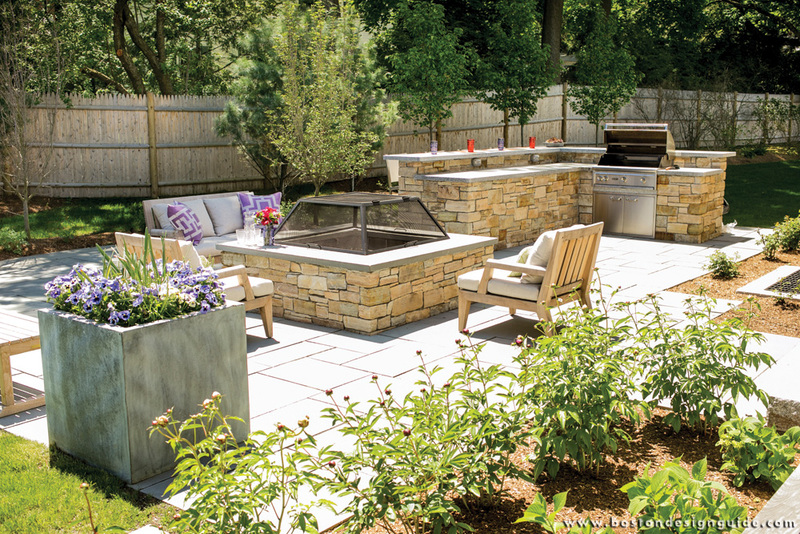 The full-service landscape contractor and designer takes an artisanal—and thoughtful—approach to its gardens and hardscapes. Here, they selected brownstone pavers for the patio’s surface and included boulders along the periphery. 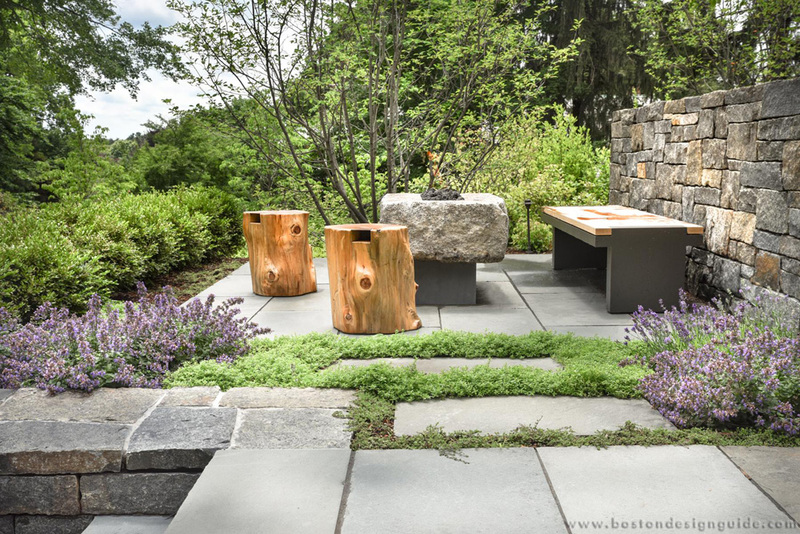 The boulders serve as an aesthetic choice as well as a practical one, as they provide additional seating around the fire.